Lynna is a partner with the firms corporate practice and is well versed in various areas of corporate matters including initial public offerings (IPOs), acquisitions, corporate restructuring, corporate banking and certain conveyancing matters such as land acquisition, sale and purchase of properties etc. Lynna started of her career first by working as a conveyancing clerk at Syarikat G.B. Neoh, Ng & Anuar (Advocates & Solicitors). 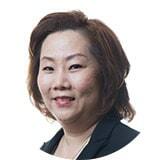 Before joining the firm in 2005, Lynna has worked with several companies, including Broken Hill Proprietary (BHP) Steel Building Products (M) Sdn Bhd and Mestiraya Sdn Bhd as a sales and marketing executive. Lynna then joined Zaid Ibrahim & Co. as a pupil-in-chambers and upon completing her pupillage period; she was retained in the corporate department.